IEC limit switch, side rotary adjustable lever with polyamide roller, 90-degree adjustable head, (1) N.O./(1) N.C. contact(s), snap action, 41mm wide body, (1) 1/2in NPT cable entry. These limit switches come equipped with snap-action contacts, 1 normally open and 1 normally closed. 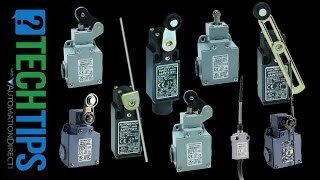 To change contact types, see Limit Switch Spare Parts & Accessories.